ESTAN DISTRIBUIDAS EN 2 PLANTAS. TV PLANA CONECTADA A SATÉLITE. UN BAÑO COMPLETO CON PLATO DUCHA CON MAMPARA. HAY UN TOTAL DE CUATRO CAMAS Y POSIBILIDAD DE UNA CAMA EXTRA. DOS DORMITORIOS CON DOS CAMAS INDIVIDUALES, UNO DE ELLOS CON TERRAZAS Y VISTA AL MAR. SOLARIUM PRIVADO CON HAMACAS., CON VISTAS COMPLETAS AL MAR , LA ISLA DE LOBOS, LA ISLA DE LANZAROTE Y AL PUEBLO DE CORRALEJO. EL SERVICIO DE LIMPIEZA SE INCLUYE EN EL PRECIO 2 VECES POR SEMANA, CAMBIO DE TOALLAS Y CAMBIO DE SÁBANAS 1 VEZ POR SEMANA. PARKING PRIVADO CON PUERTA AUTOMATICA CORREDERA CON MANDO A DISTANCIA, CON ACCESO AL JARDIN Y A LA ENTRADA PRINCIPAL DE LA VILLA. Soy universitario, relativamente joven, me gusta practicar deportes, musica, lectura. La edifique en el año 2000 para disfrutarla con mi familia. Cercania al mar, para practicar deportes y disfrutar de las playas proximas.La terraza donde esta situada la piscina privada es una zona amplia donde se puede tomar el sol en alguna de la cuatro hamacas, hay una puerta por la que se accede al mar que está a unos 20 metros. Dispone de Parking privado , con puerta automatica accionable con un mando , que te entregaremos a tu llegada. A la entrada a la Villa hay con una superficie de unos 25 metros cuadrado con flora de Canarias. Tiene un balcon terraza con vistas al mar. Tambien dispone de una zona para tomar el sol nudista. Tiene dosporces uno exterior en la puerta de entrada y otro interior con vistas a la Isla de Lobos y tambien a la Isla de Lanzarote. En las inmediaciones hay varias instalaciones para jugar al tenis. A unos 30 kms, hay dos Campos de Golf en la zona del Castillo de Fuste(Antigua). Tiene unas dimensiones de 7 metros de largo por 2 de ancho, no está caliente., para uso exclusivo de nuestros invitados. CENTRO COMERCIAL EL CAMPANARIO PROXIMO. A 10 MINUTOS CAMINANDO DEL CASCO ANTIGUO DE CORRALEJOS. AMPLIA OFERTA GASTRONOMICA. Muchas gracias José Carlos por sus elogiosos comentarios sobre su estancia en nuestra Villa. Es la mayor satisfacción que podemos recibir y que nuestros amigos-clientes guarden un buen recuerdo. Deseamos vuelva algún día y hasta ese momento le deseamos mucha salud y felicidad. We had a great time from start to finish, we were greeted at the villa by Ingrid who showed us round the property and explained everything in detail. We also had a direct telephone number for any questions during our stay. We will definitely return and recommend your services to friends and family. We had a peaceful, relaxing stay in the villa. It is situated in a fantastic location and is spotlessly clean. Sergio and the team were very friendly and helpful - nothing was too much trouble. 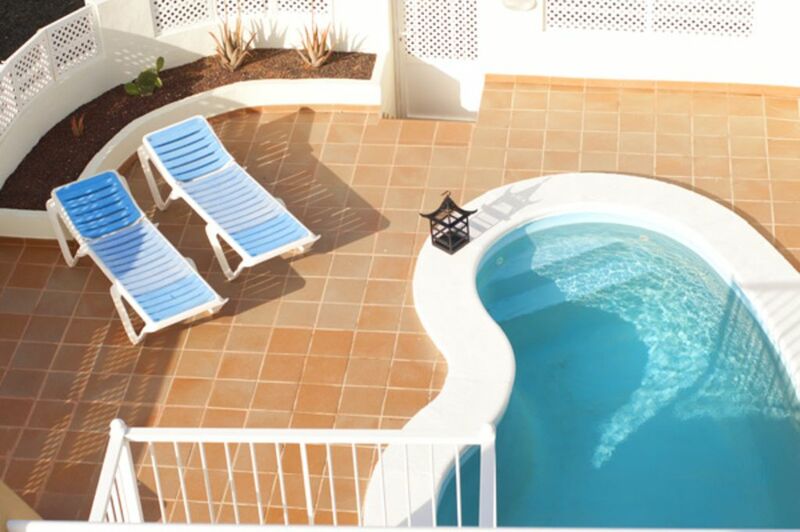 We wouldn’t hesitate in recommending the villa to others and look forward to a return visit. Villa as advertised, roomy and plenty of outdoor spaces. Well serviced by Sergio and his wife Kelly, nothing too much trouble. Owner Francisco very accomodating and quick to respond to queries or requests. Great location secondline from beach. Near to all facilities of the town, which is busy and thriving. My wife and I enjoyed our seven week stay very much. We wish you a happy return home and hope that once again you choose Corralejo for a new vacation, we will be happy to welcome you again. What a lovely villa in such an ideal location! 10 mins walk to town so nice and quiet but close enough for a leisurely stroll there and back. Also very close to El Campanario where there are several other bars, restaurants and shops. The villa itself was absolutely spotless and contained everything we could need for a comfortable fortnight's holiday. Sergio and his family who look after it maintained it beautifully for us and despite not speaking much English (and our Spanish leaving a lot to be desired!) were lovely and easy to deal with. There were no fans or air conditioning that we found but we didn't find the villa overheated at all, it's easy to open doors and air it and it seems to be angled in such a way that the sun doesn't shine directly in, so it stays nice and cool. Booking with Francisco, the owner, was easy, and no request seemed to be too much trouble, including the last minute request for a late checkout on our last day due to flight times.